An exhibition of landscape photographs by one of Britain’s most famous artists, Sam Taylor-Wood, will go on show at the Parsonage on Friday 17 July until Monday 2 November 2009. The exhibition will be formally opened on Friday by broadcaster and art critic Matthew Collings. 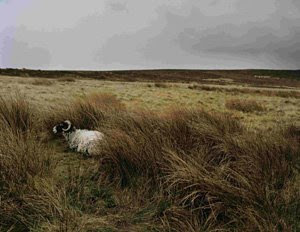 The series, titled Ghosts, was shot on the moors near Top Withens, the fictional place where Emily Brontë’s Wuthering Heights is set, and the novel serves as a backdrop to Sam Taylor-Wood’s photographs. The landscape in Ghosts is bleak and unremitting, and echoes the brutal portrayal of heightened passion and suffering found in Wuthering Heights. Traces of the novel are found in Taylor-Wood’s landscapes; in Ghosts II, two solitary leafless trees, twisted towards each other, embody Cathy and Heathcliff and throughout the series Sam Taylor-Wood’s response to the book has been to photograph the wildness of the air that inspired Brontë’s novel. The series was originally exhibited as part of Sam Taylor-Wood’s most recent show, Yes I No, at White Cube, London in October 2008. The photographs have been resized to fit the Parsonage and will be exhibited in the period rooms of the Brontë Parsonage Museum as part of its Contemporary Arts Programme 2009. The exhibition has been made possible with the support of Arts Council England and the City of Bradford Metropolitan District Council. “Exhibiting such powerful work by such a prominent artist is tremendously exciting. As well as showcasing the ways in which the Brontës continue to influence contemporary culture, Ghosts is also an important addition to the strong legacy of landscape photography in the area. Sam Taylor-Wood (b.1967) graduated from Goldsmiths College in 1990 and has received international critical acclaim for her work in photography and film. In 1997 she was awarded the Illy Café Prize for Most Promising Young Artist at the Venice Biennale and a Turner Prize nomination followed in 1998. Taylor-Wood is at the centre of the Young British Artist movement of contemporary British art, part of the same generation as Damien Hirst and Tracey Emin. Since her first solo exhibition at White Cube in 1995, she has had numerous solo exhibitions, including being the youngest artist ever to be granted a solo exhibition at The Hayward Gallery. In 2004 she famously exhibited a film of David Beckham asleep. The work was commissioned by the National Portrait Gallery and is in their permanent collection. Solo exhibitions include Kunsthalle Zurich (1997), Louisiana Museum of Modern Art, Humlebaek (1997), Hirshhorn Museum and Sculpture Garden, Washington DC (1999), Museo Nacional Centro de Arte Reina Sofía, Madrid (2000), Hayward Gallery, London (2002), State Russian Museum, St Petersburg (2004), MCA, Moscow (2004), BALTIC, Gateshead (2006), MCA Sydney (2006), MoCA Cleveland (2008) and Contemporary Art Museum, Houston (2008). For further information about the exhibition or arts events contact jenna.holmes@bronte.org.uk/ 01535 640188. The local residents' free admission day is Saturday 8 August, not 15 August as reported recently. I am compiling a census of two Bruxelles 1849 adaptation editions of Jane Eyre in French language. If any one knows of any copy other than those listed below, please let me know. 1. The first is: Jane Eyre. Bruxelles: Alp. Lebegue, imprimeur-editor. 1849. Translated by “O.N.” (Old-Nick; i.e. P. E. Durand-Forgues.) 2 v in 1. This is an adaptation of pp143;104. It is discussed by Emile Langlois in Brontë Society Transactions Part 81, No.1 of Volume 16, 1971. It is shown in one copy on COPAC, that at Cambridge and in three copies on OCLC, at Cambridge, Princeton and Leiden University. 2. The second is: Jane Eyre. Bruxelles: Meline, Cans et Compagnie. 1849. No translator listed but now known to be the same Durand-Forgues as in book (1) above. 2 v. Pp [iv] + 269; [iv] + 284. In 27 chapters. Not discussed by Langlois or listed in any Brontë bibliography. No copy in COPAC or OCLC. I have a copy which so far is the only one located. Neither book shows in American Book Prices Current (ABPC online) for recorded auctions since 1978, or on Artfact or Jahrbuch der Auktionspreise. The Bodleian has not posted their pre-1920 books on COPAC but a check of their catalogue shows they have no Jane Eyre editions, Bruxelles, 1849. The British Library has neither edition. Bibliotheque royale de Belgique and the Belgian Union Catalogue have neither. Bibliotheque nationale de France and the French Union Catalogue locate neither edition. Koninklijke Bibliotheek, the national library of the Netherlands, confirms they have neither edition; their search of the Dutch Union Catalog confirms that only Leiden University holds the Alp. Lebegue adaptation edition and the Meline edition is not found.